This is only going to be funny / amusing if you’re a nerd. You’ve been warned. We recently built in a web filtering solution as a part of ExchangeDefender. It’s agent based, free and has over 80 categories that you can selectively drop connectivity to as a matter of corporate policy. Well, Hank was playing with it today and blocked all the “Ad” sites which would redirect all the requests to ad content to our nasty-grammed web site. 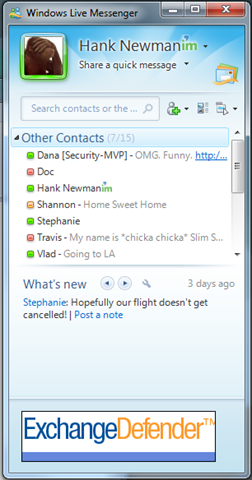 Take a look at what that did to the Instant Messenger window. P.S. If you’re wondering what’s new here, we’re hard at work at adding OTP / two factor authentication to ExchangeDefender and Shockey Monkey. If you’d like to test it, open a support request and ask to be put in the dev queue for OTP. You have to either have an RSA SecurID token, an AuthAnvil token or for our free OTP/2FA an iPhone/iPod Touch 3 with access to iTunes. All your ads are belong to us!